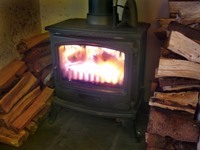 As our cold, hard winter finally breaks across New England, many wood stoves will receive a well deserved rest. Far from relics, the U.S. Energy Information Agency estimates that nation-wide, 2.5 million households burn wood as their primary heat source and 9 million utilize wood as a secondary heating source. In states such as Maine, nearly 14% of households burn wood as a primary source of heat while over 50% use it for supplemental heating, according to U.S. Census figures. With such large numbers of households generating heat from wood, it should come as no surprise that new rules from the Environmental Protection Agency (EPA) putting a damper on wood stove emissions would stoke the fires of many New Englanders. Posted on April 18, 2014 by Mat Todaro and tagged EPA Clean Air Act 111(b) Emissions Wood Stove Clean Technology.